I am glad to welcome you to the website of National Scientific Center «Institute for Soil Science and Agrochemistry Research named after O.N. Sokolovsky»! NNC ISSAR is a leading scientific and methodical center, that heads and coordinates in Ukraine research projects on the problems of Soil Science, Agrochemistry and Soil Conservation. We are open to the international cooperation. The Institute team is in friendly and creative relations with a wide range of scientific partners abroad, e.g., in Austria, Belarus, Bulgaria, Canada, China, France, Germany, Moldova, Russia, Spain, Switzerland, USA. The NSC ISSAR has been validated under the EU framework programme for research and innovation HORIZON 2020 as a public body, non profit, research organization. It’s Participant Identification Code is 962522465. Currently, the NSC ISSAR and its leading scientists are included to 16 international organizations. Among them - National Committee of UNESCO "Man and Biosphere" International Union of Soil Science (IUSS), European Society for Soil Conservation (ESSC), International Soil Tillage Research Organisation (ISTRO), International Commission on Irrigation and Drainage, Soil Science Society of Poland, Russia, Belarus, International Organization "Commonwealth agrochemisters and chemists agroecologists" and others. In 2013 the Institute became a member of the European Technology Platform «FOOD FOR LIFE». In March 2014 there was a very important event for our organization. 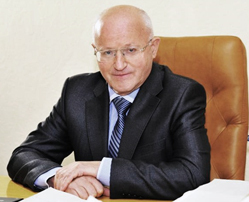 National Scientific Center «Institute for Soil Science and Agrochemistry Research named after O.N. Sokolovsky»was registered as a partner of Global Soil Partnership (GSP) - the first one from Ukraine. (GSP website - http://www.fao.org/globalsoilpartnership/en/). The first Plenary Assembly of the Global Soil Partnership took place on 11 to 12 June 2013 at FAO headquarters in Rome. Support harmonization of methods, measurements and indicators for sustainable soil management, with a national validation that takes into account the differences of production systems and ecosystems.